Heidel and Raya, the Seattle -Kirkland based mural artists painted larger than life murals at the Roman Casino in Seattle. 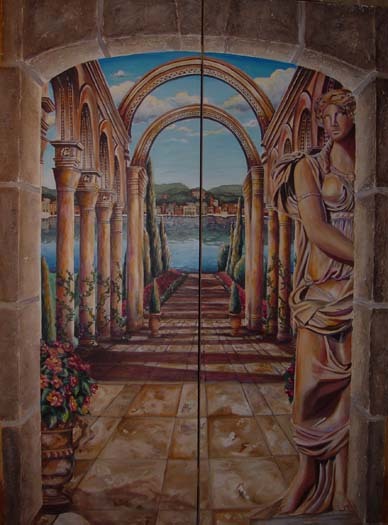 The expansive arched doorway murals lead into the famous sites in Rome. 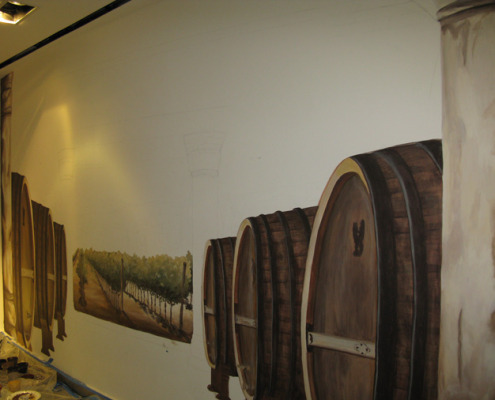 Each mural is designed , sketched, hand painted and original. 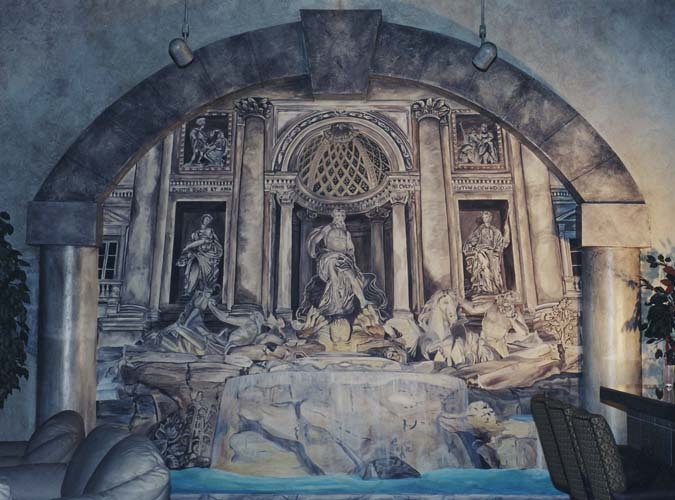 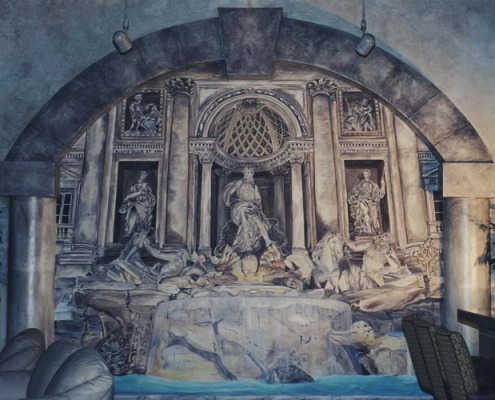 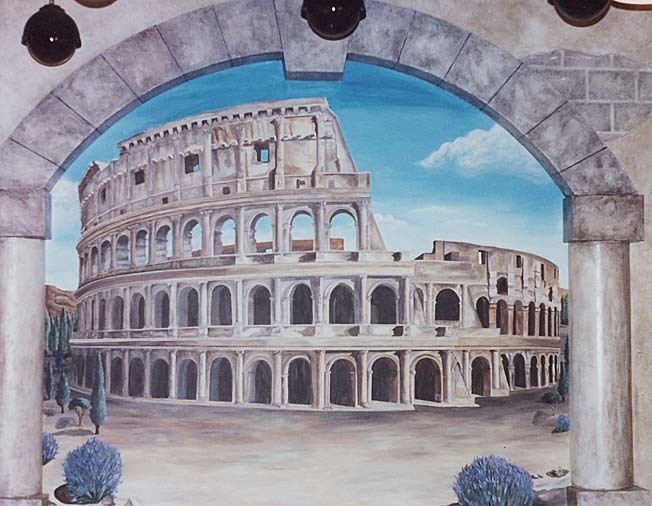 The mural painting captures great detail of the fabulous old world architecture of Rome. 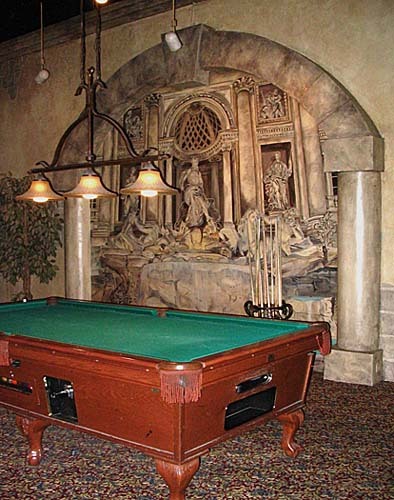 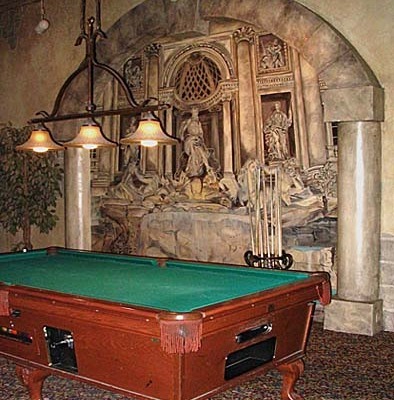 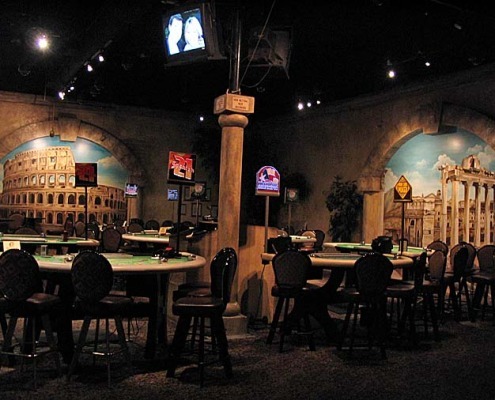 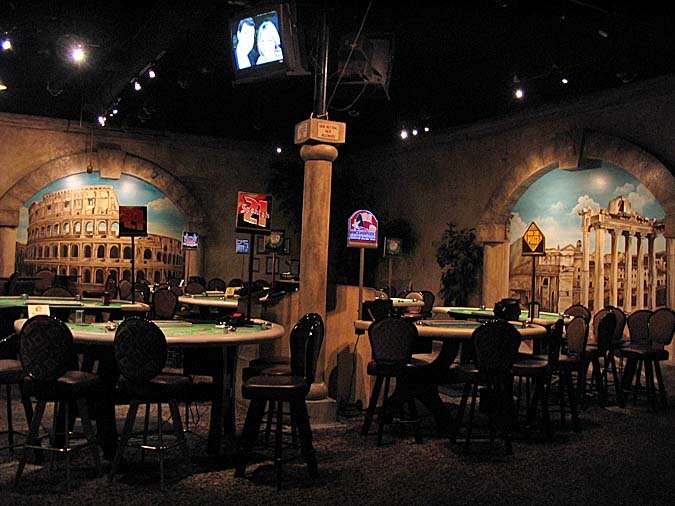 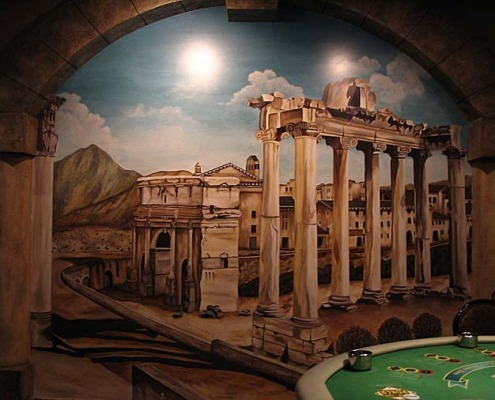 The muralist created the casino interior design to take you back to ancient Rome. 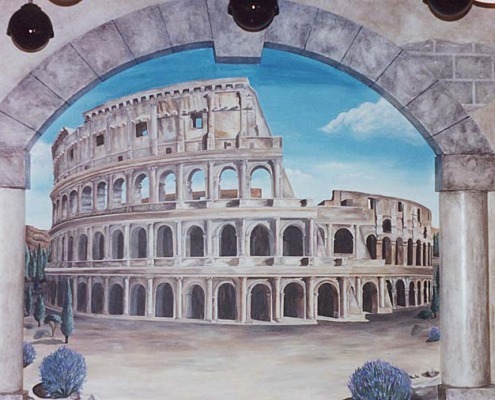 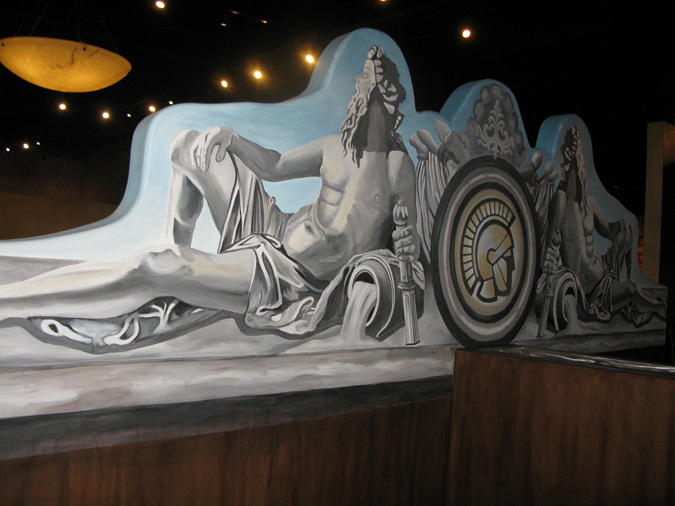 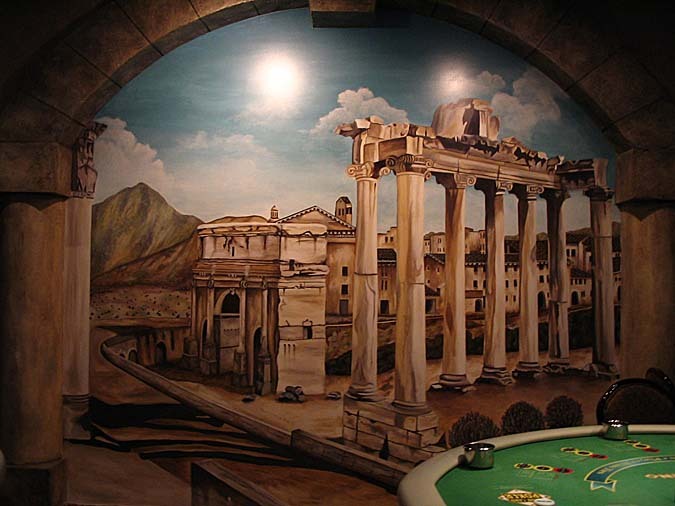 The Roman Casino is a great opportunity to get a taste of Rome in the Seattle area through the beautiful mural views. 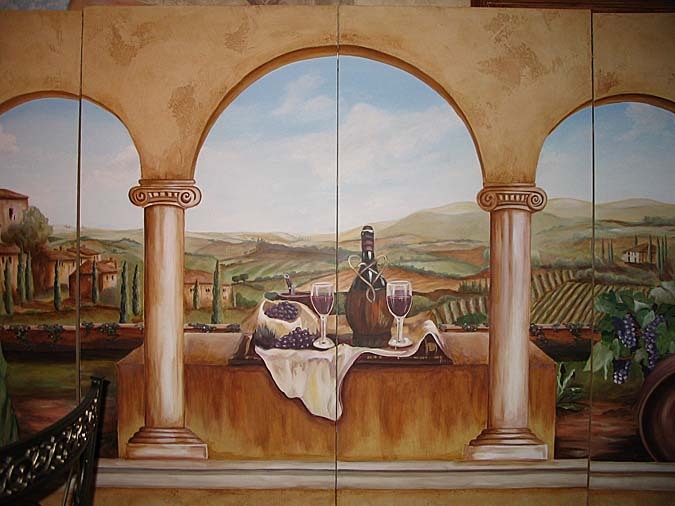 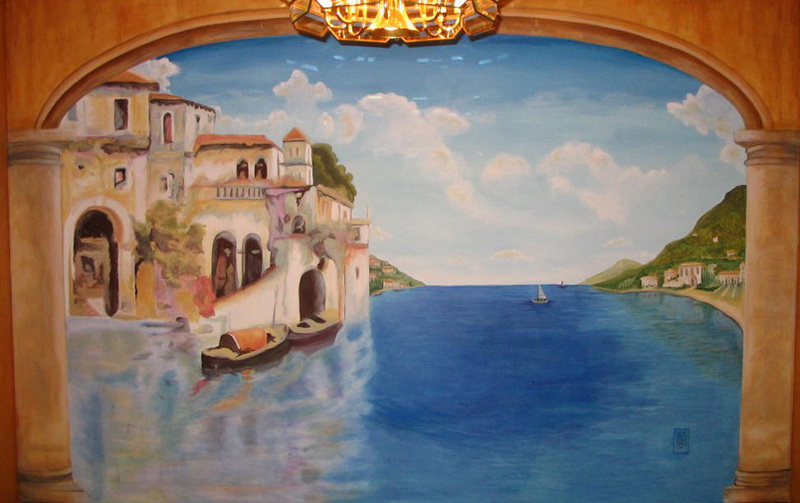 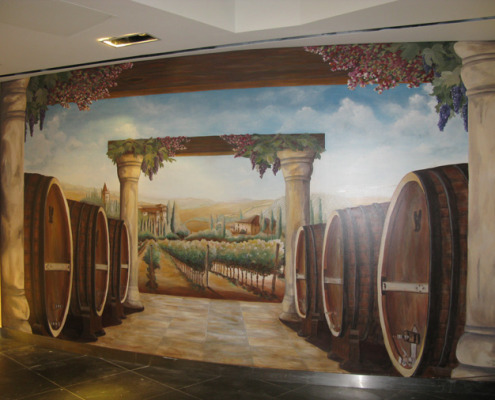 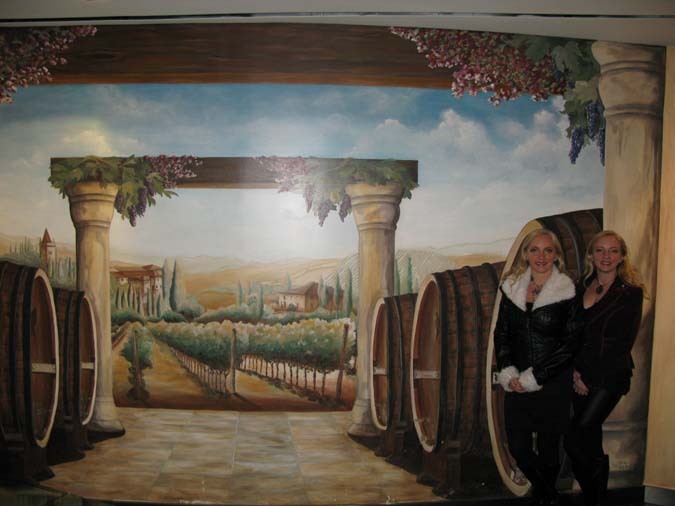 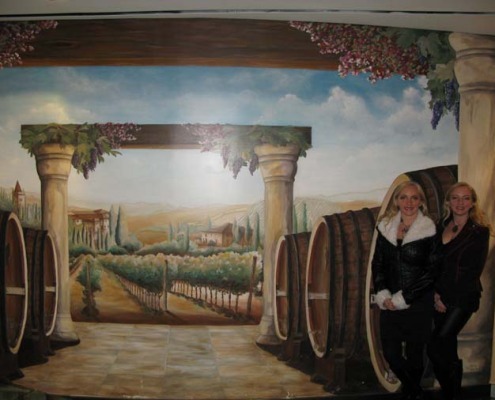 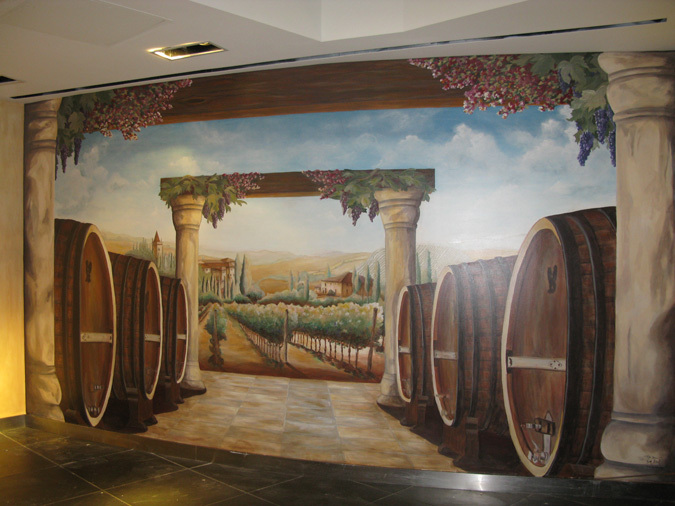 The vineyard mural above was painted in Dal Toro in the Venetian Palazzo Hotel in Las Vegas. 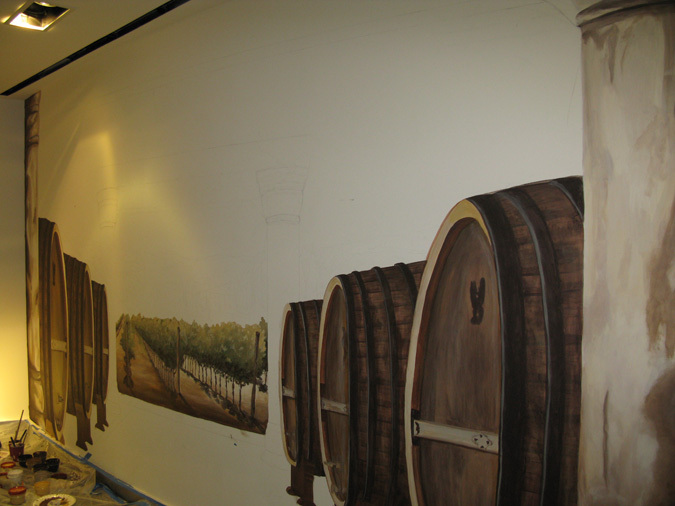 The larger than life wine barrels lead out to beautiful vineyards all hand painted by our muralist. 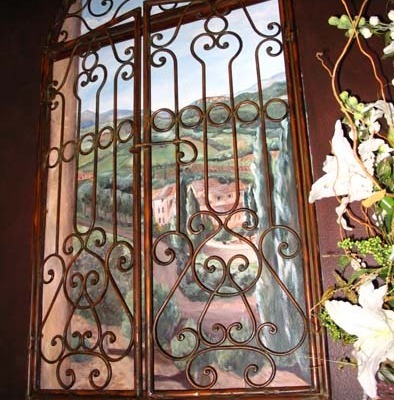 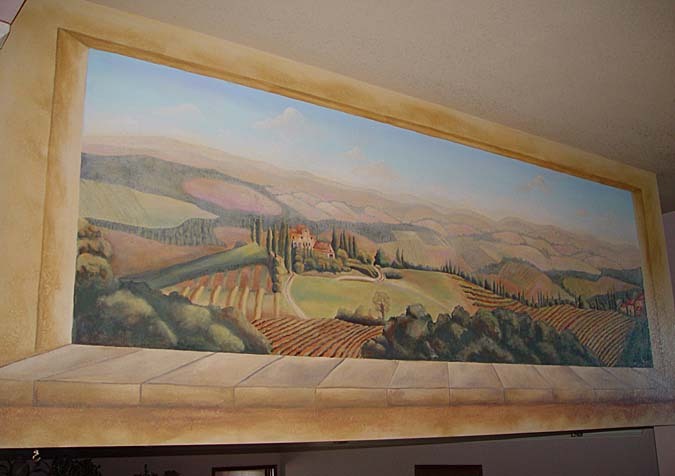 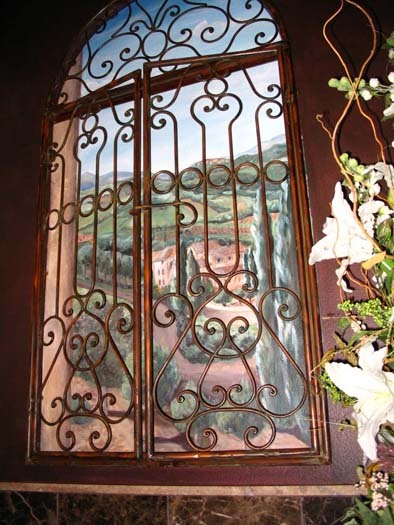 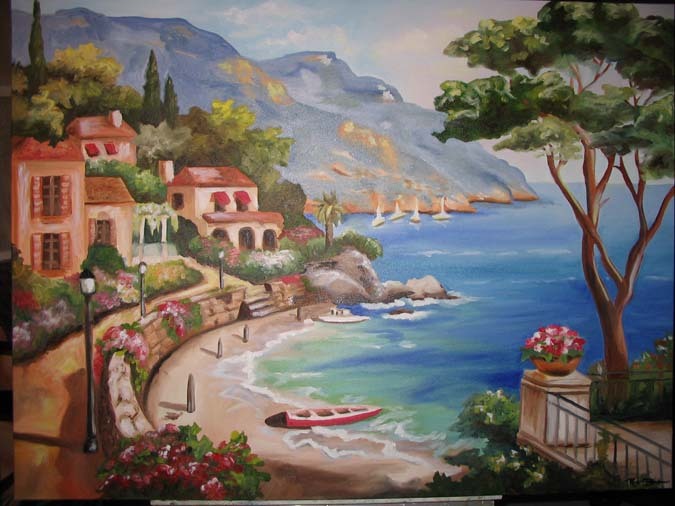 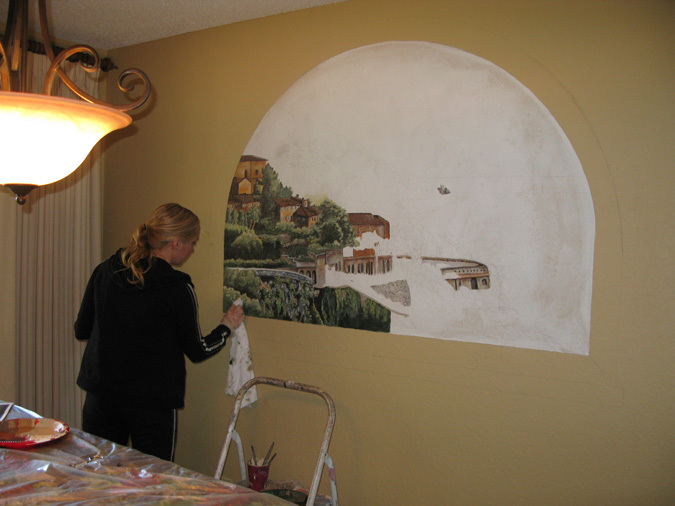 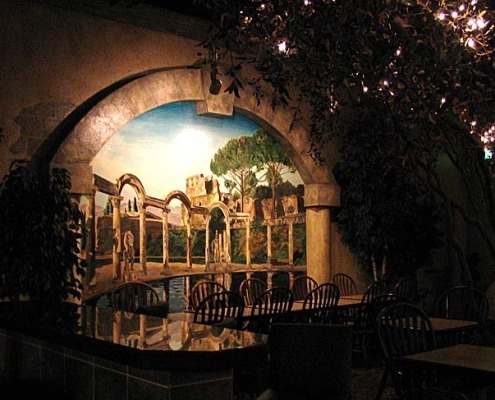 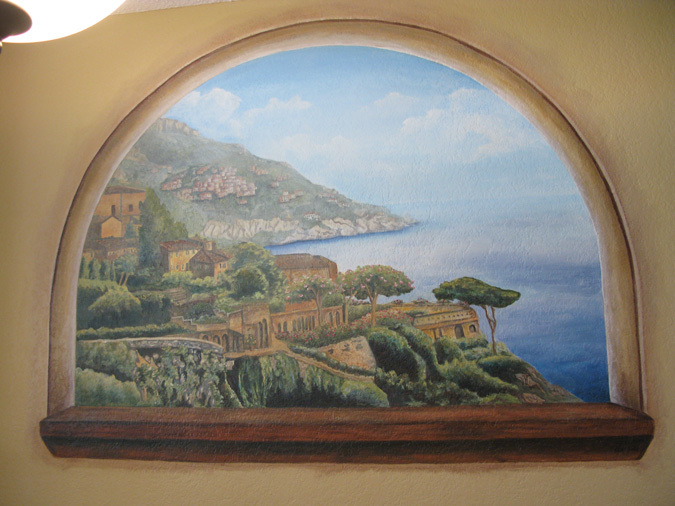 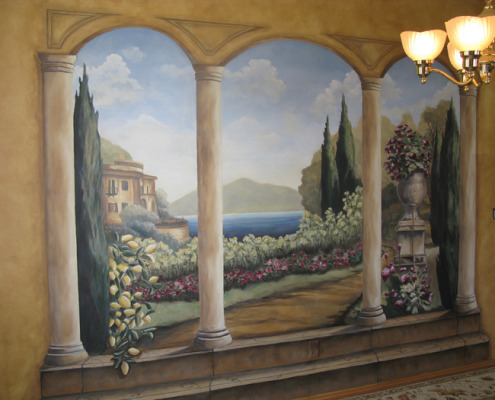 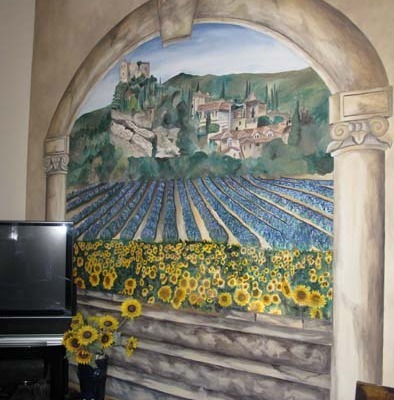 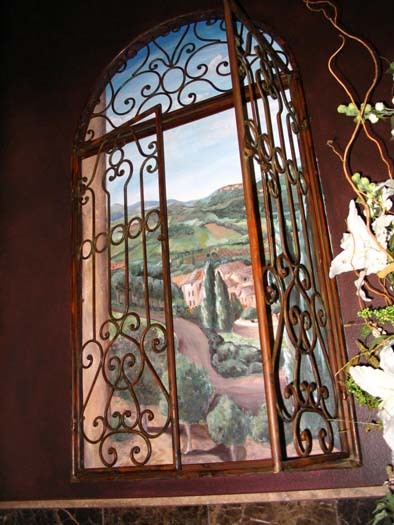 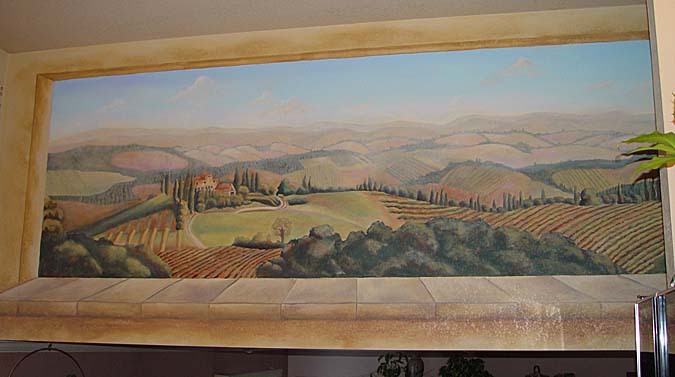 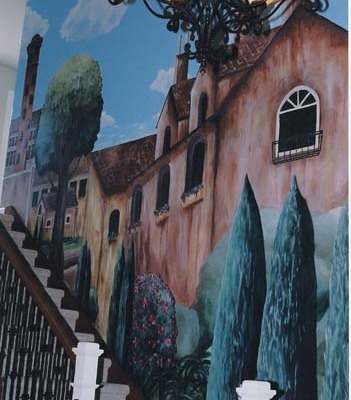 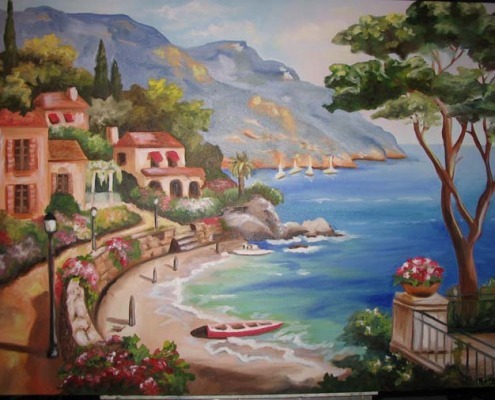 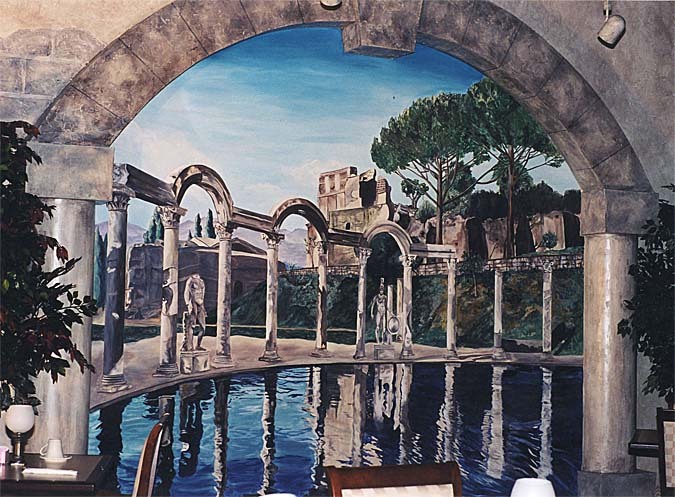 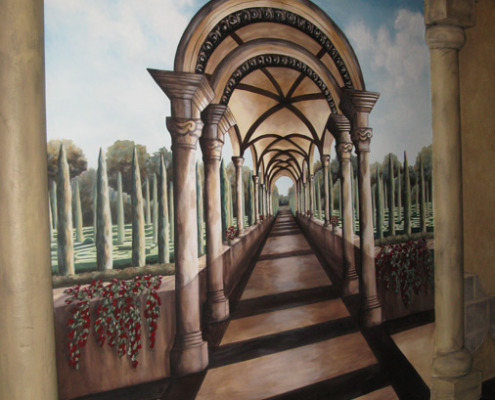 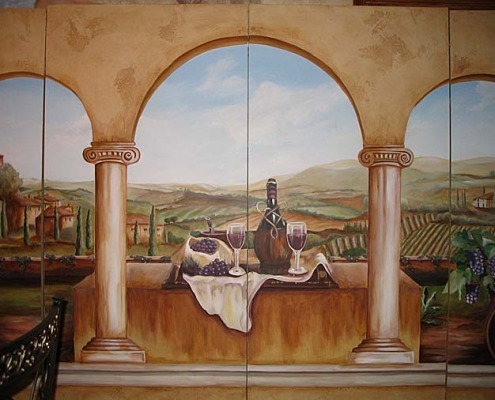 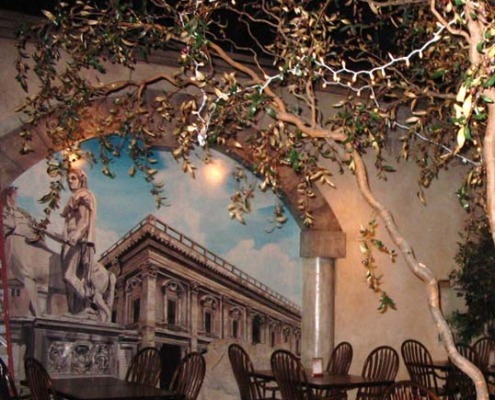 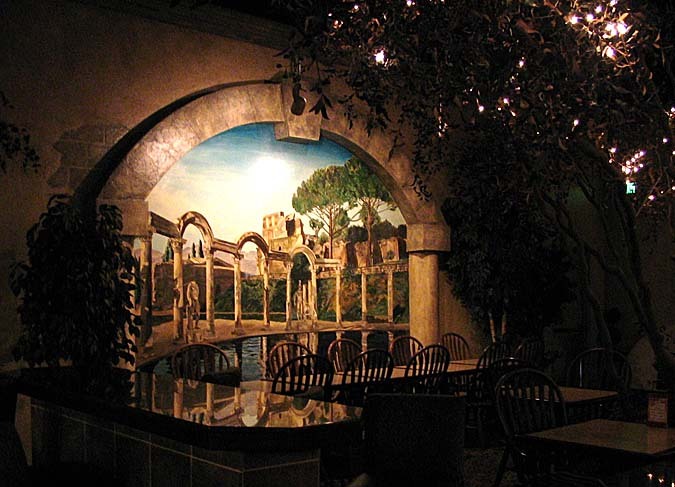 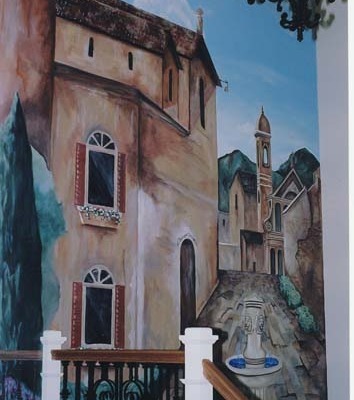 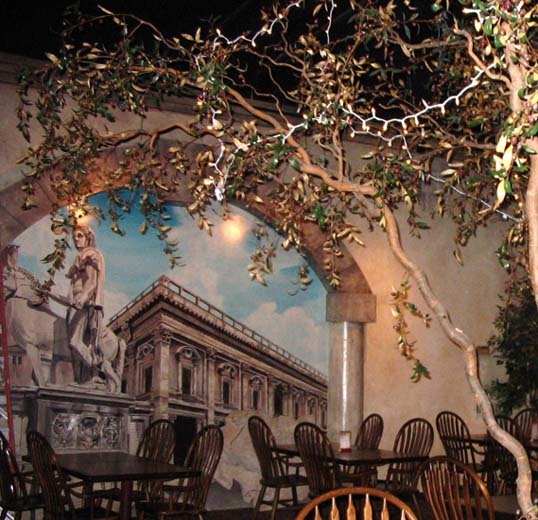 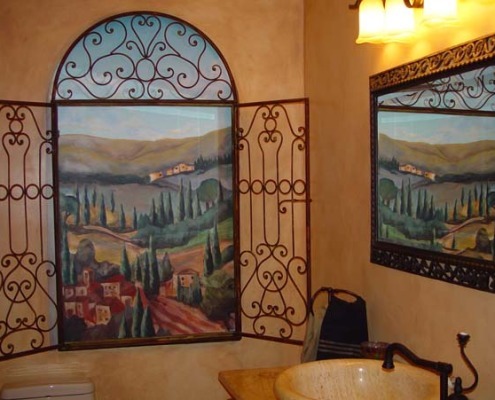 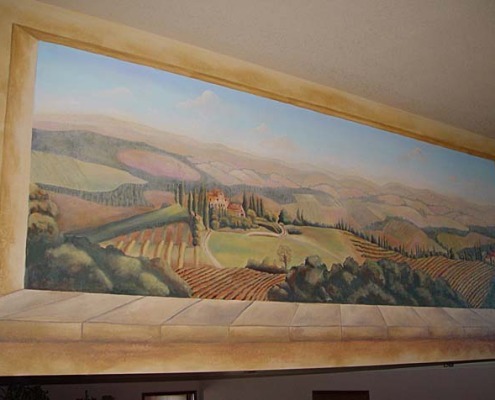 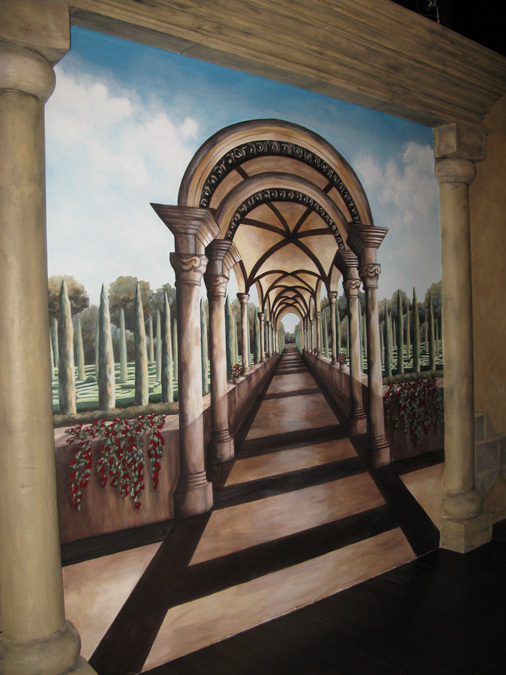 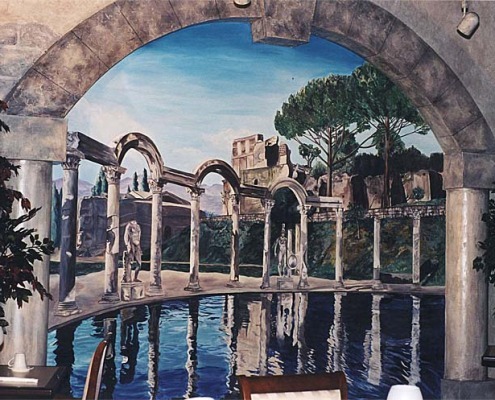 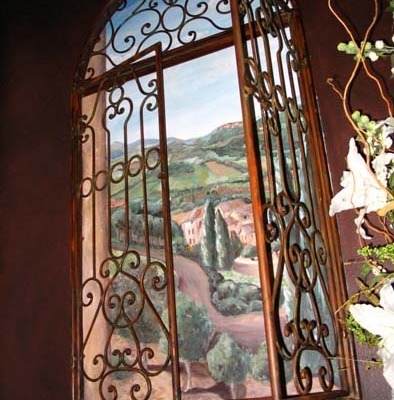 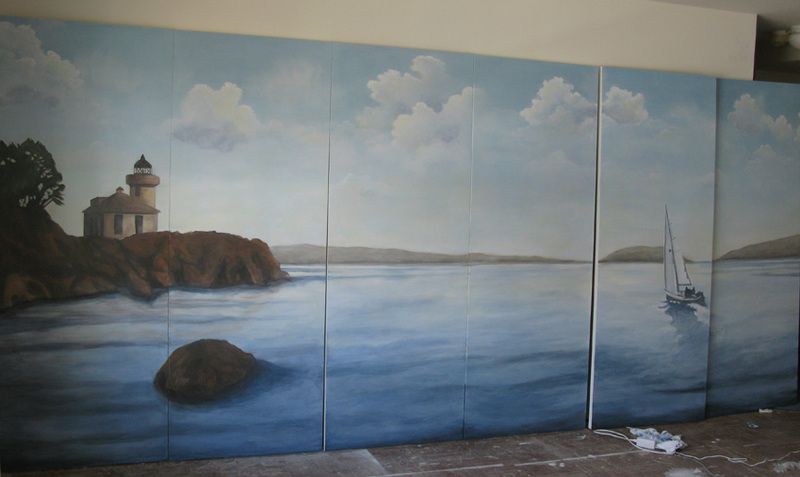 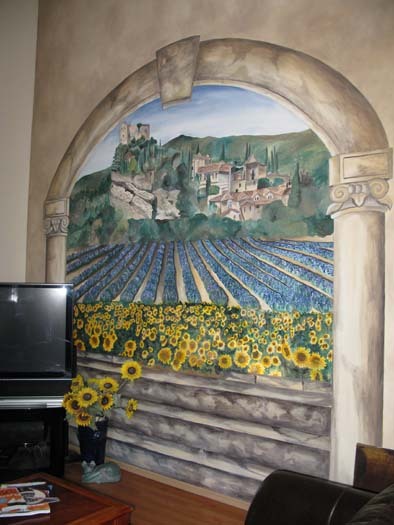 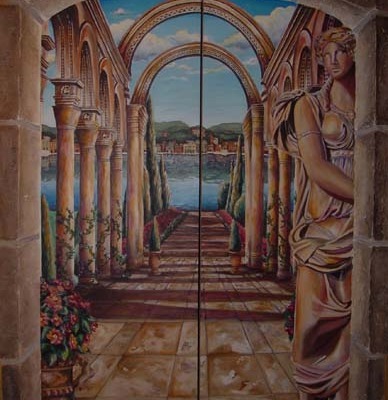 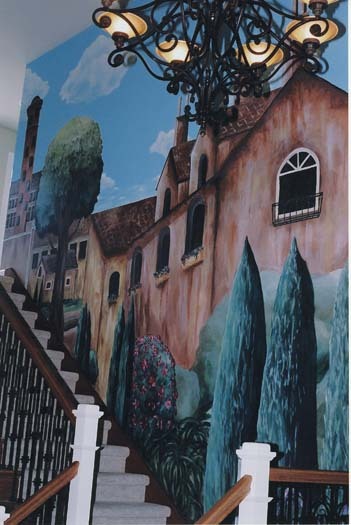 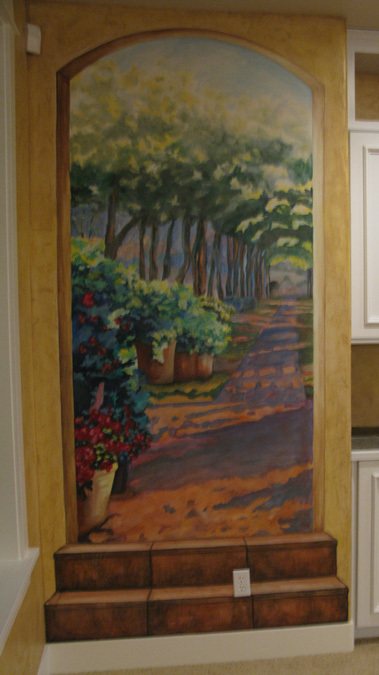 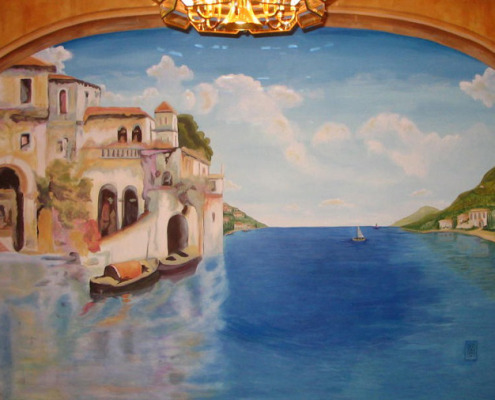 This mural was designed in with an Italian landscape to fit the theme of the restaurant. 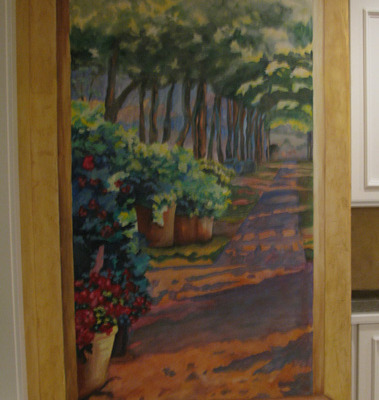 See the video section for a time lapse video of this project. 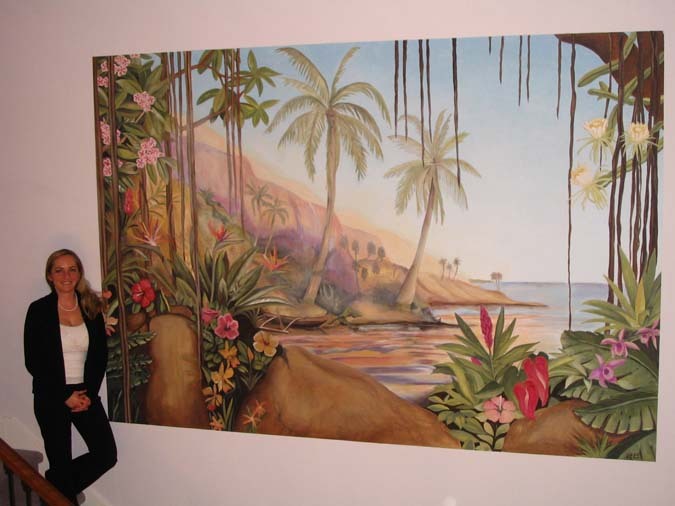 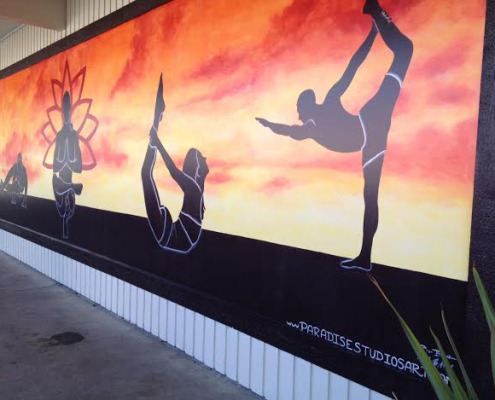 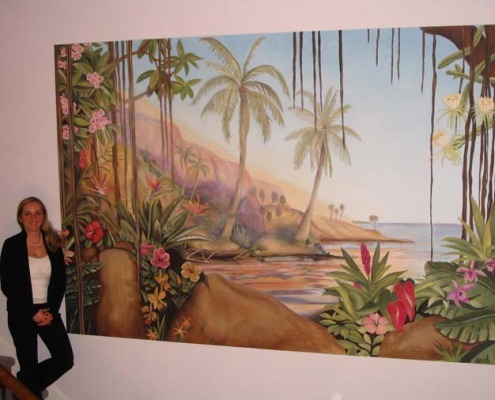 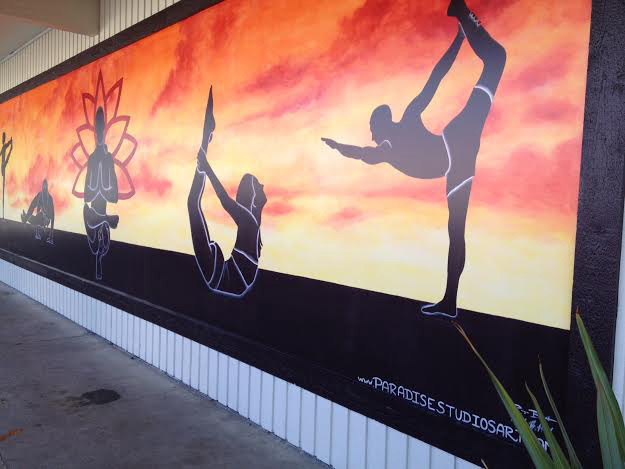 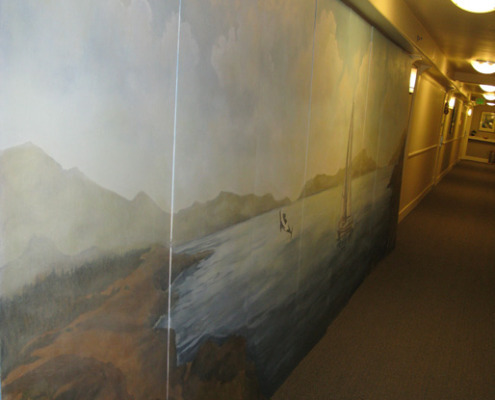 The Hawaii tropical mural was painted in an entryway in the Bellevue area. 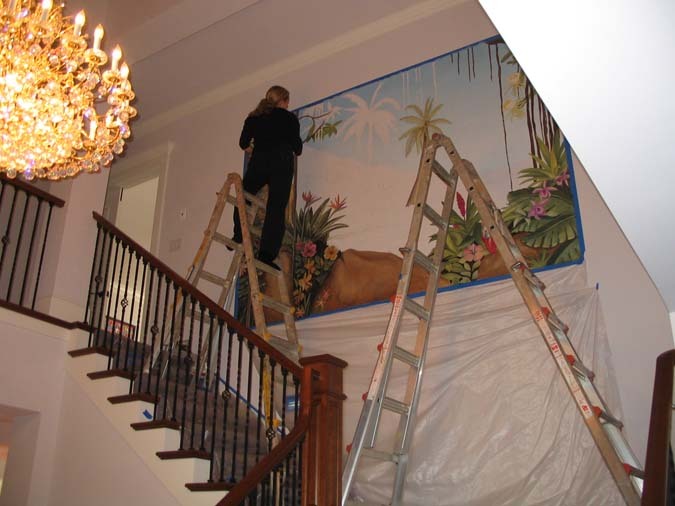 With Banyan trees and tropical flowers the mural creates a serene interior design element for this entryway. 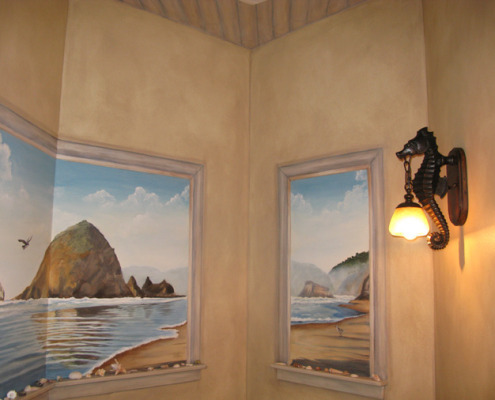 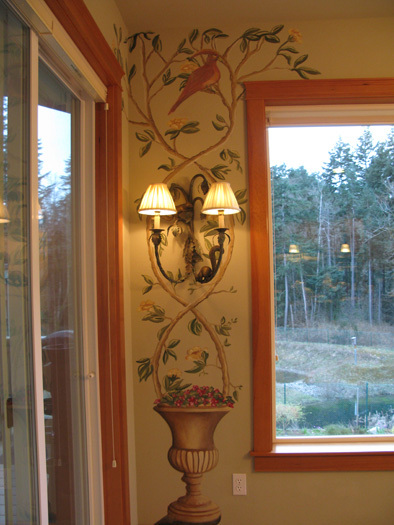 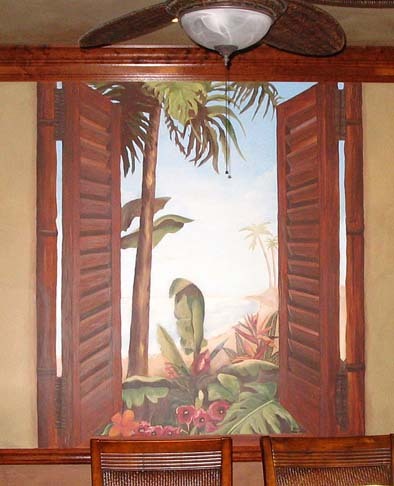 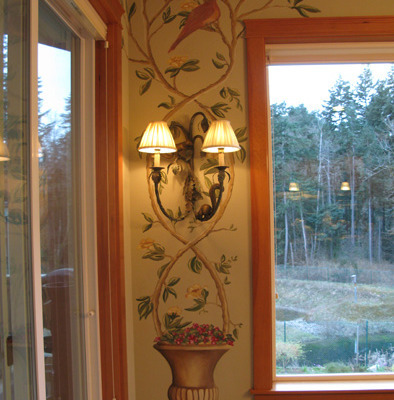 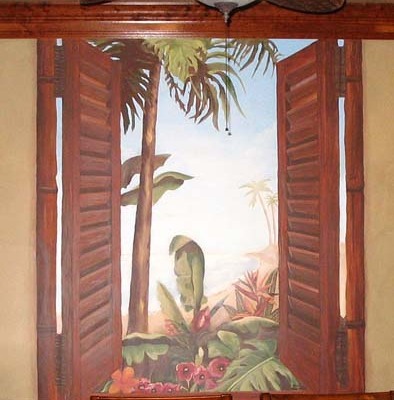 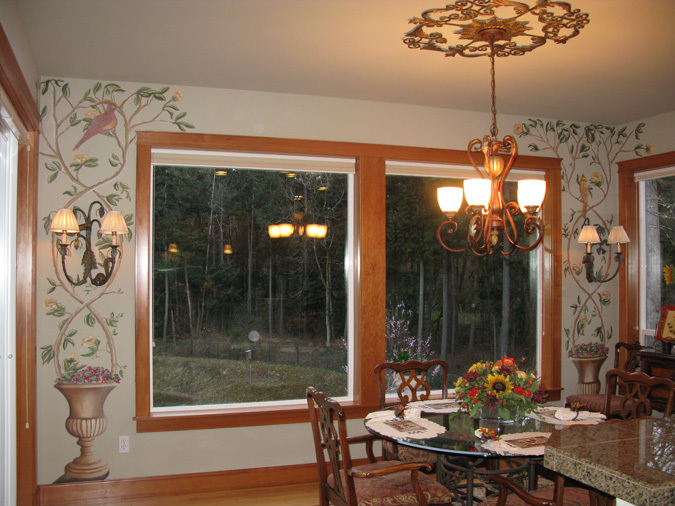 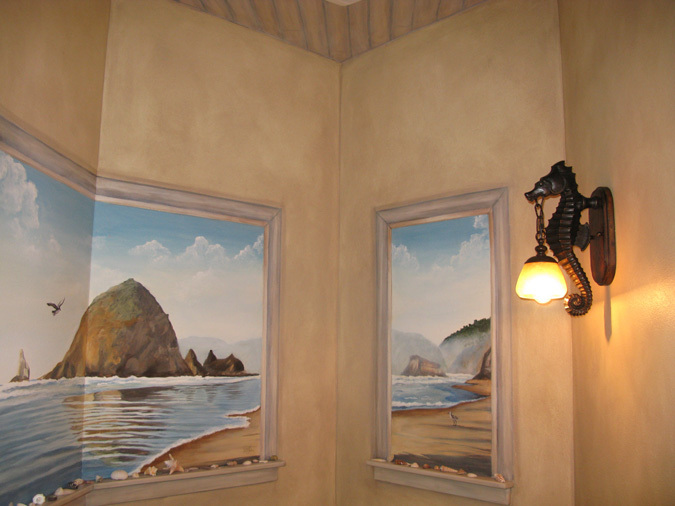 The tropical window trompe l’oeil mural with shutters was painted in Kirkland / Seattle area. 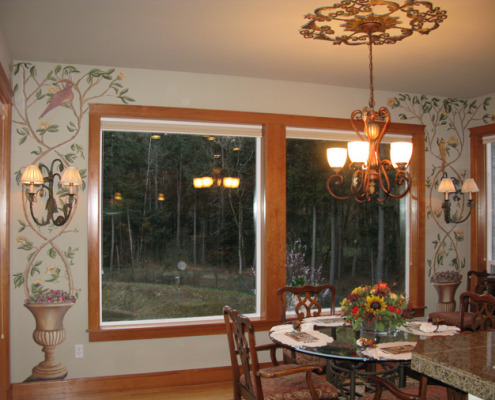 See the before and after to see the amazing transformation of the interior design in this dining room. 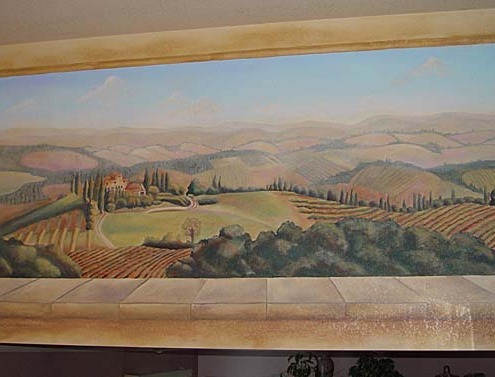 Other mural pictures in this gallery include: Italian courtyard mural in Bellevue, Italian Hillside Vineyard mural in Bellevue, formal garden mural Bellevue, French countryside mural in Medina, Tuscan landscape mural in Redmond, wine still life vineyard mural in Kirkland, Italian village in Sammamish, French Vineyard Mural in Redmond, Tuscan hillside mural in Seattle, Sorrento by the sea mural in Tacoma, Trompe l’oeil Castle Stairwell in Olympia, Italian Waterfront Mural in Olympia, and Italian seaside mural in Bellevue. 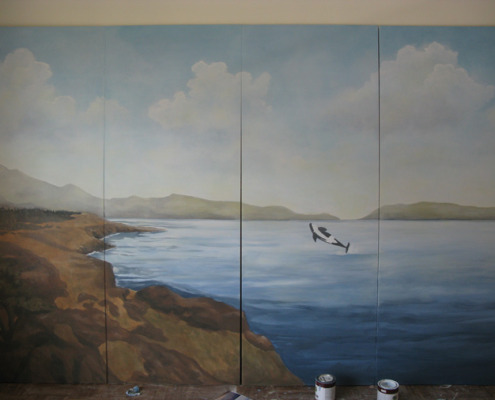 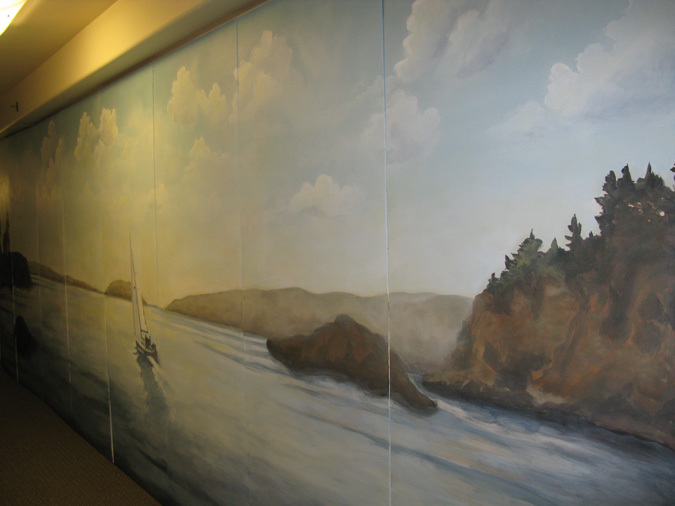 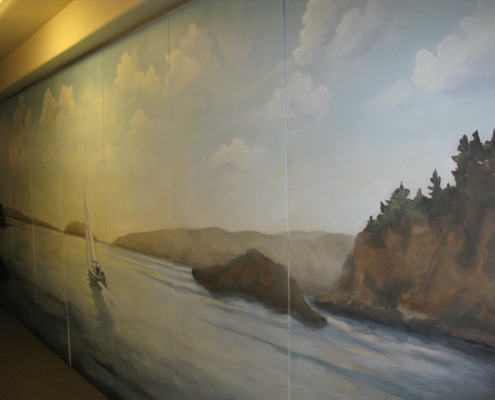 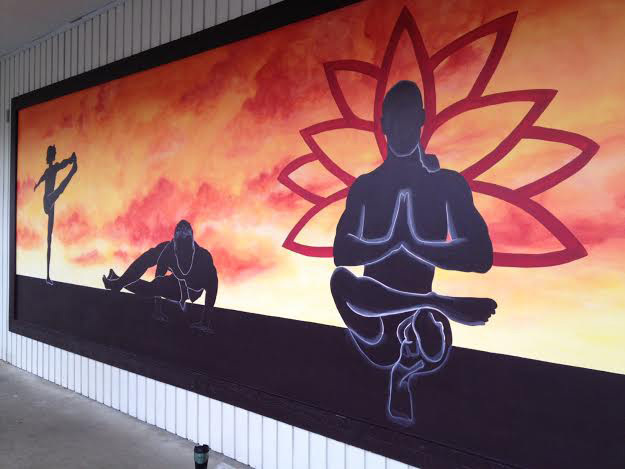 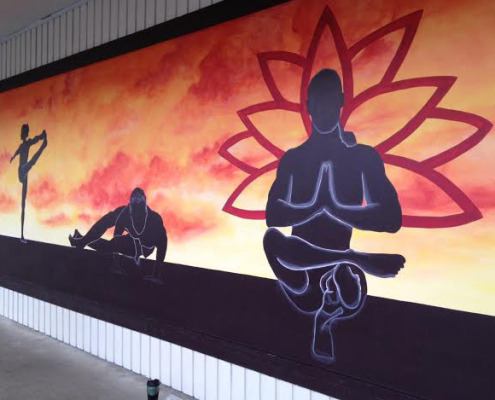 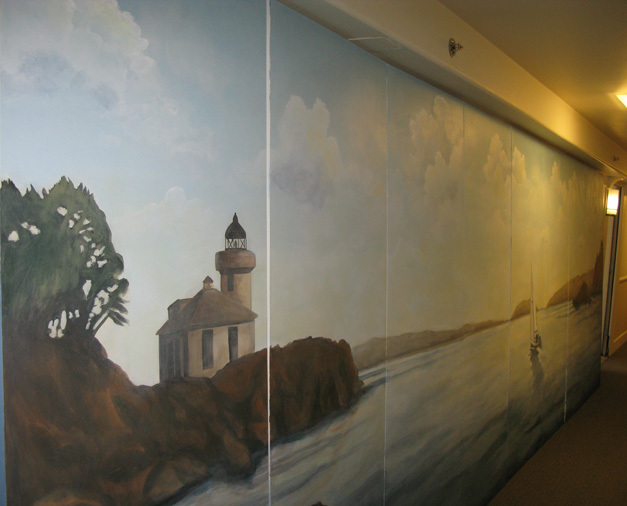 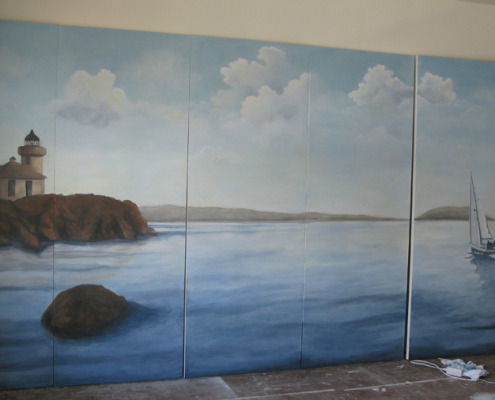 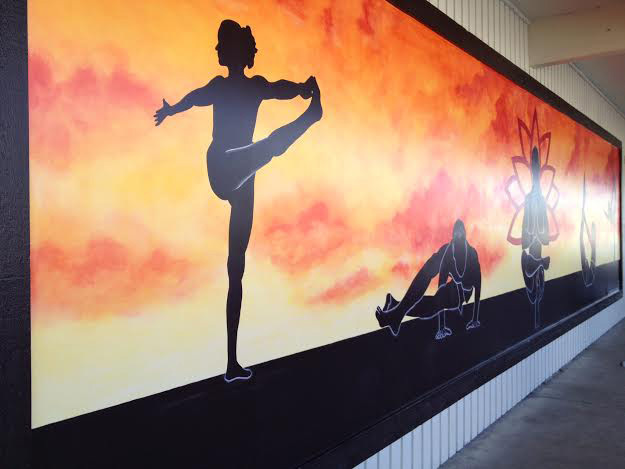 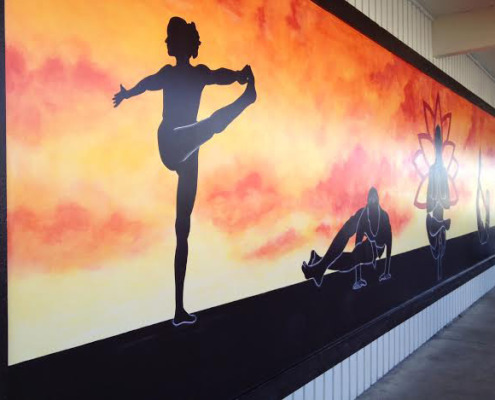 Our Seattle based mural artists will help with the creation, design and detailed large scale painting of your mural. 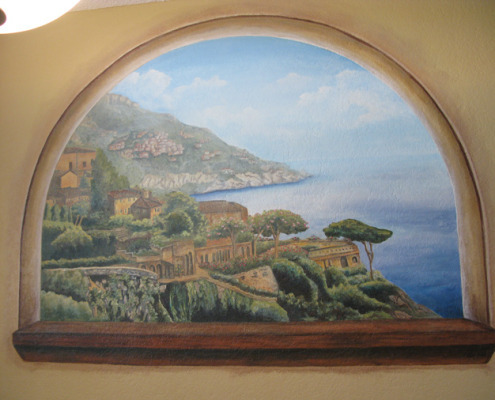 Imagine gazing through a doorway looking out on an Italian vineyard or a balcony on the bluff of the Mediterranean Sea. 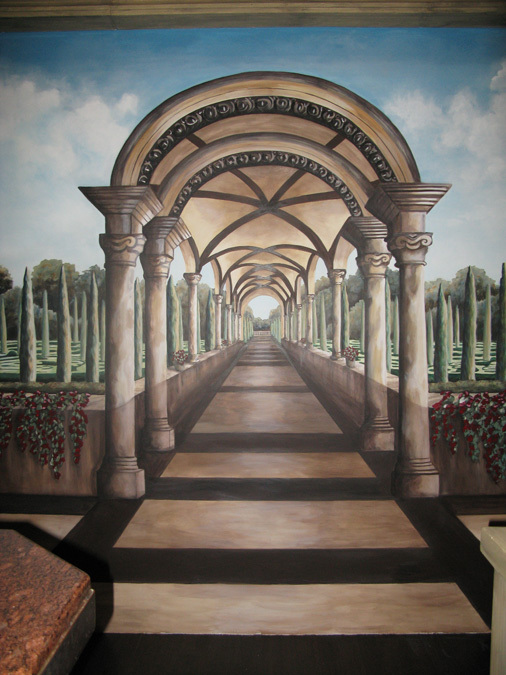 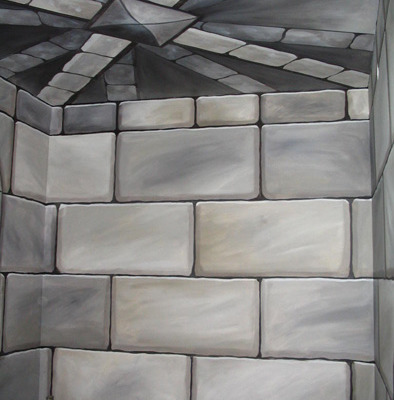 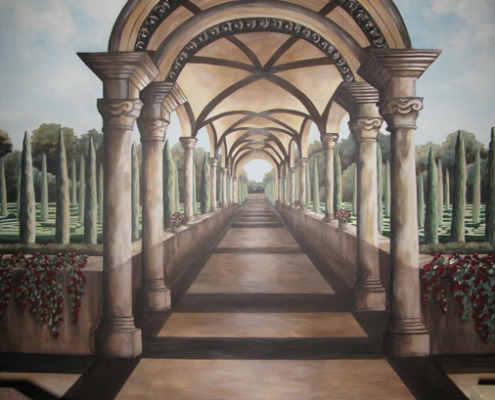 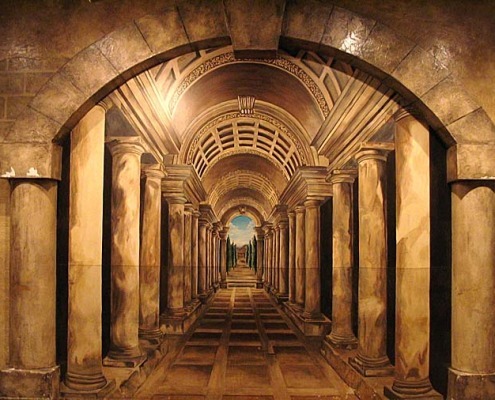 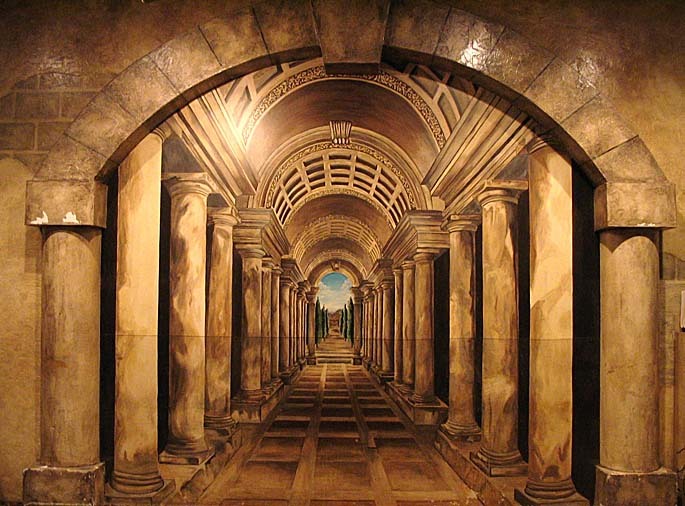 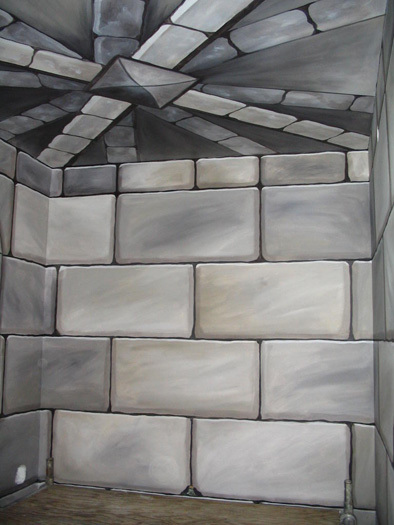 A unique trompe l’oeil mural will take you away to another place and time. 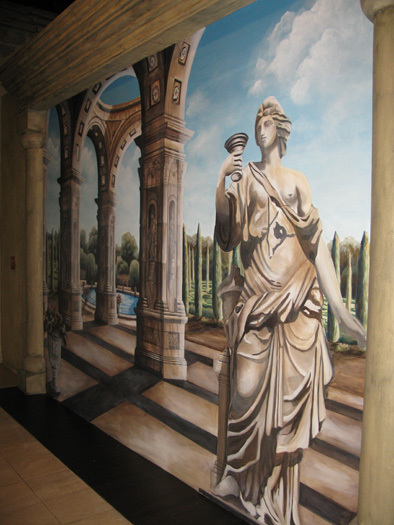 Paradise Studios designs and creates stunning wall murals and ceiling murals in any style, theme and size in Seattle and surrounding areas. 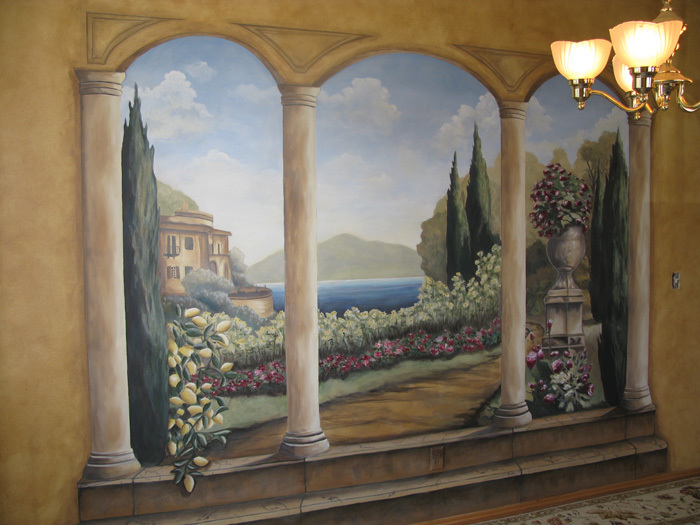 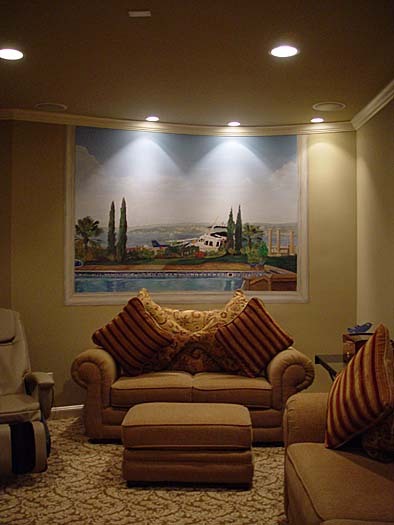 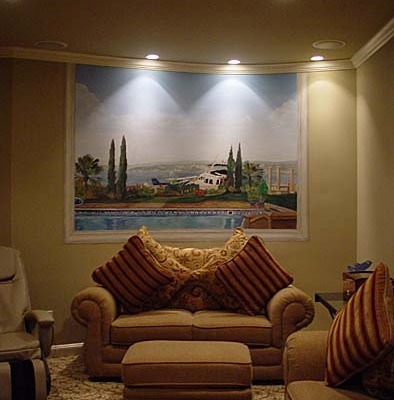 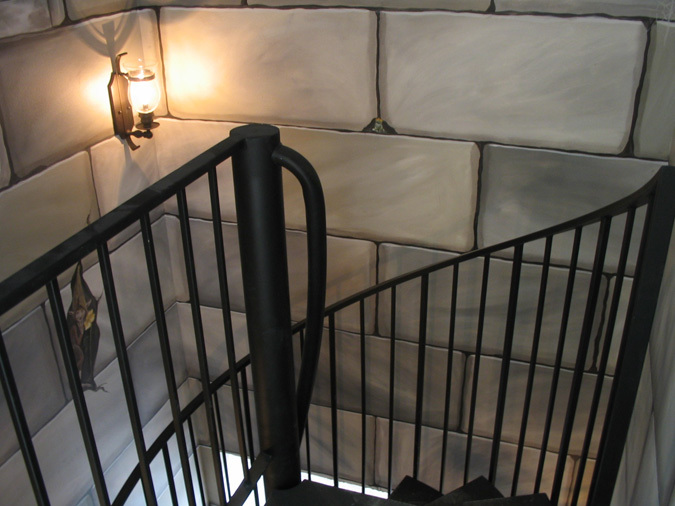 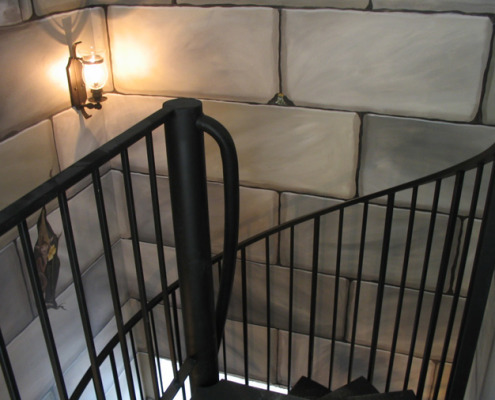 Our muralist create custom designs for any room in your home or business. 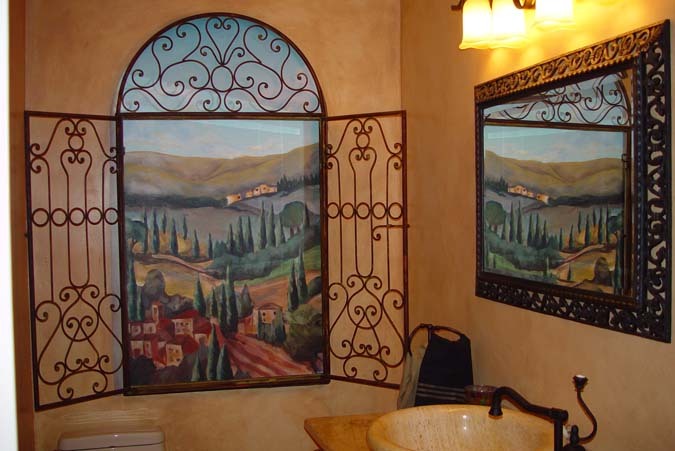 With painted doorways and windows you can create a view in a powder room , dining room, living room , wine cellar, home theater or bedroom. 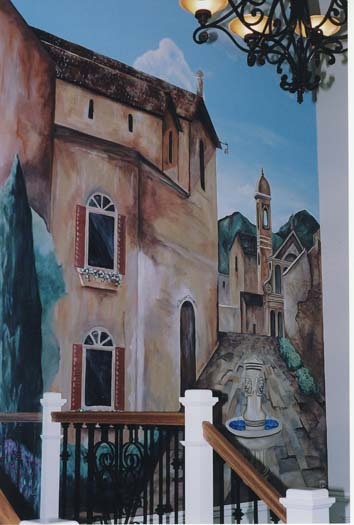 From breathtaking scenes to whimsical children’s murals, the diverse possibilities are endless. 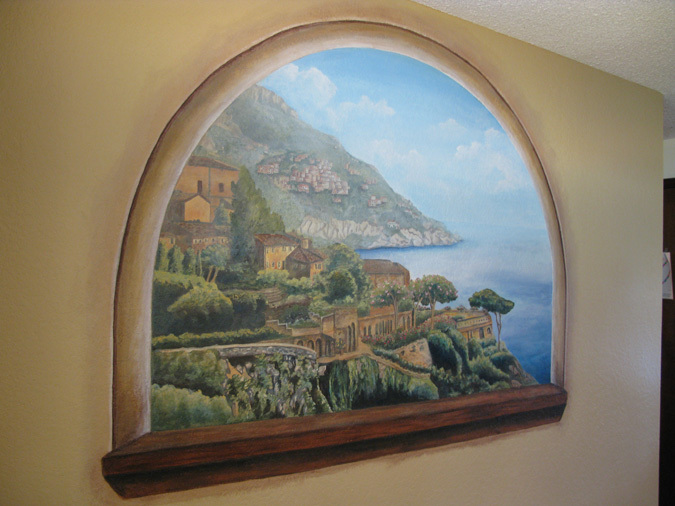 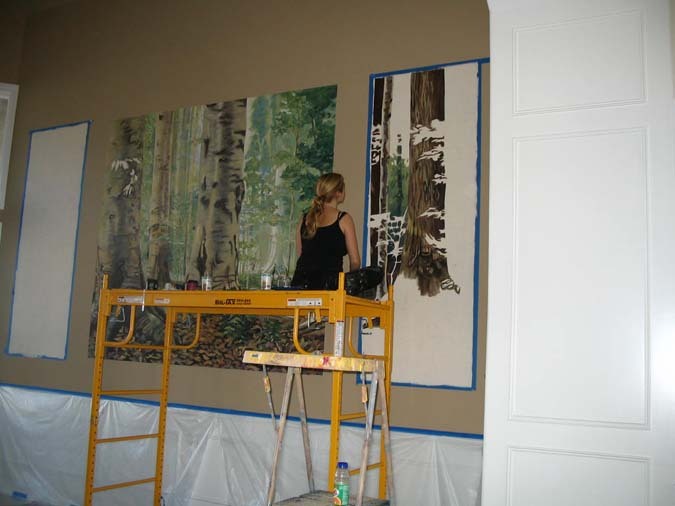 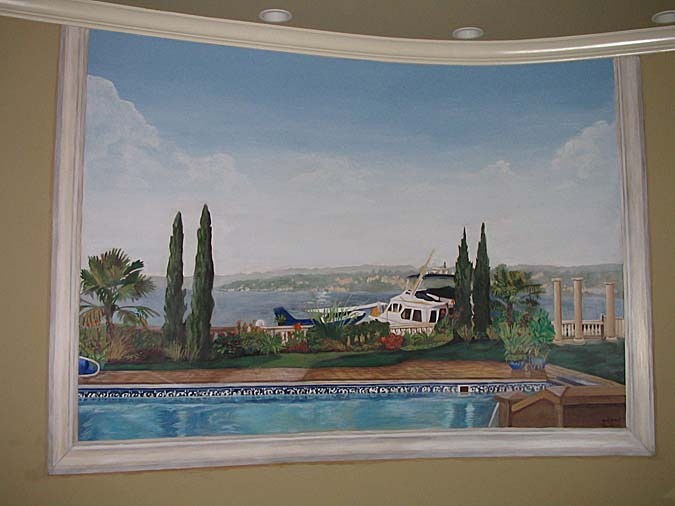 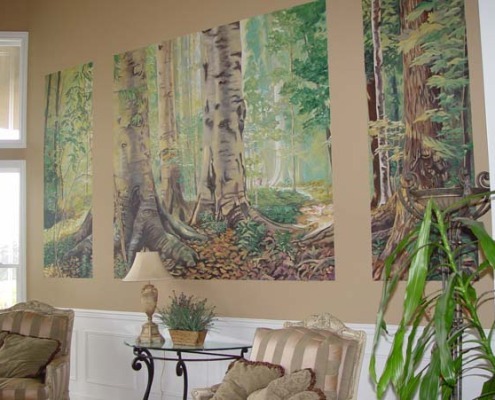 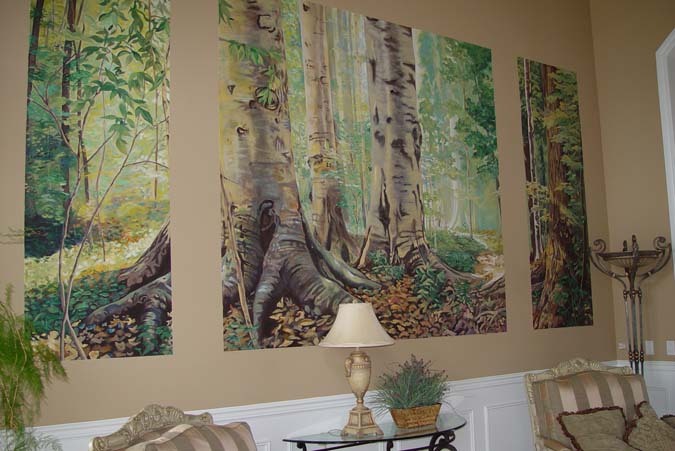 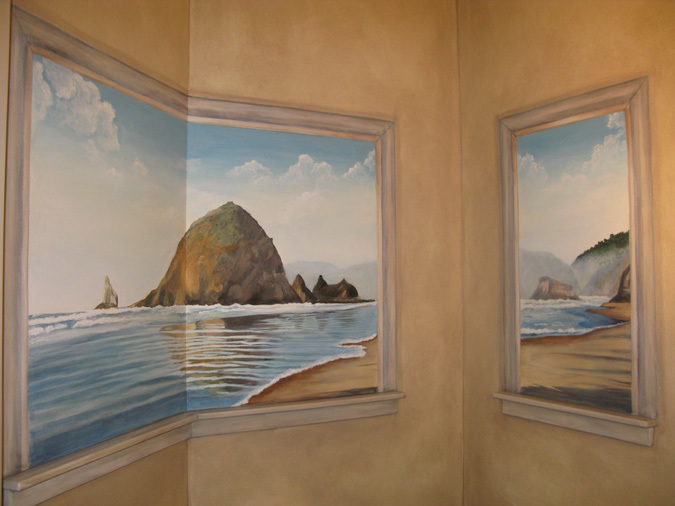 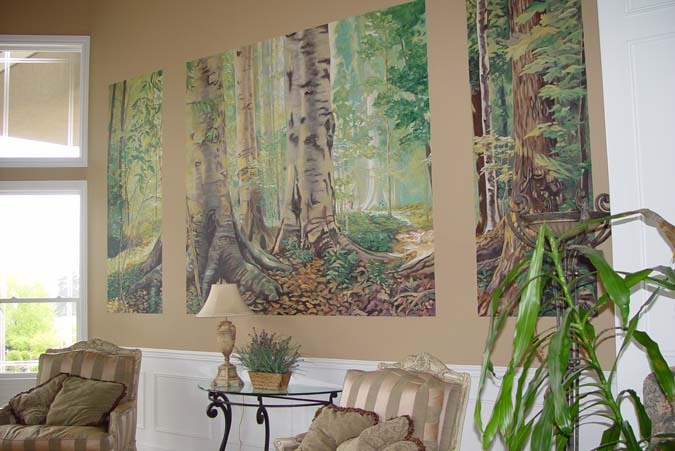 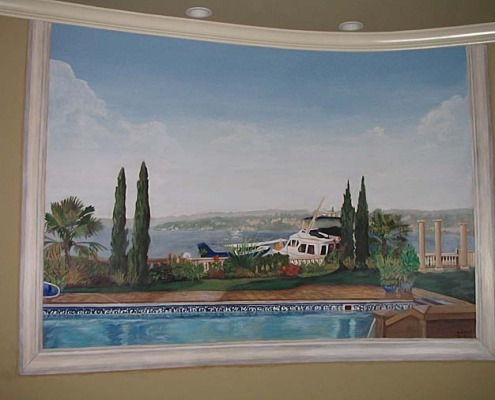 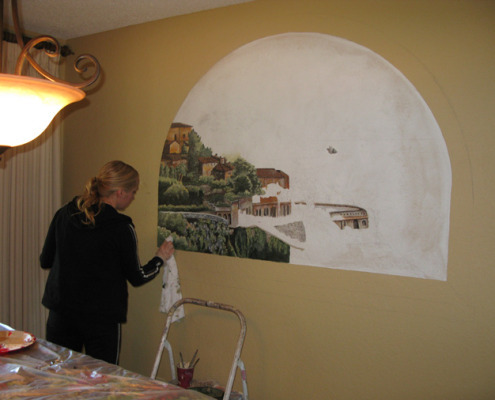 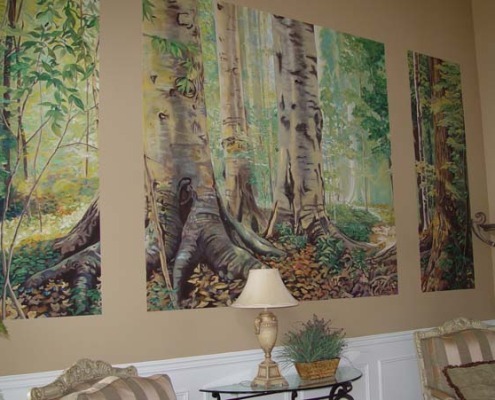 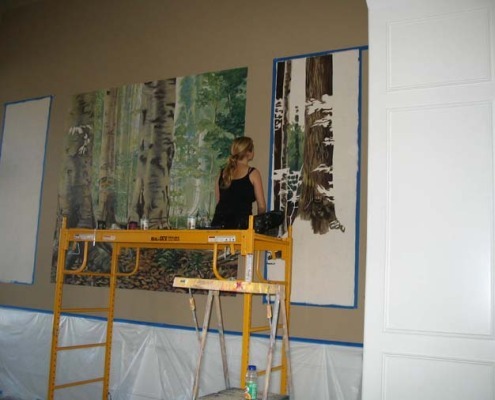 Our muralists have attention to detail and 15+ years experience in fine art and interior design. 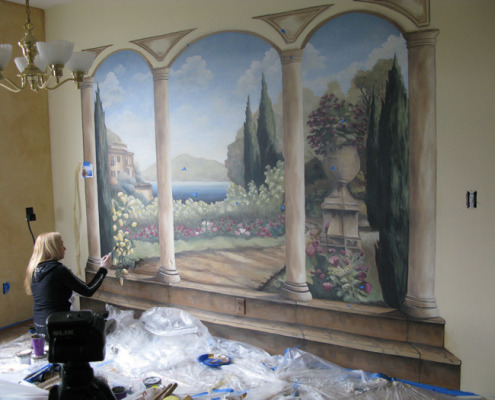 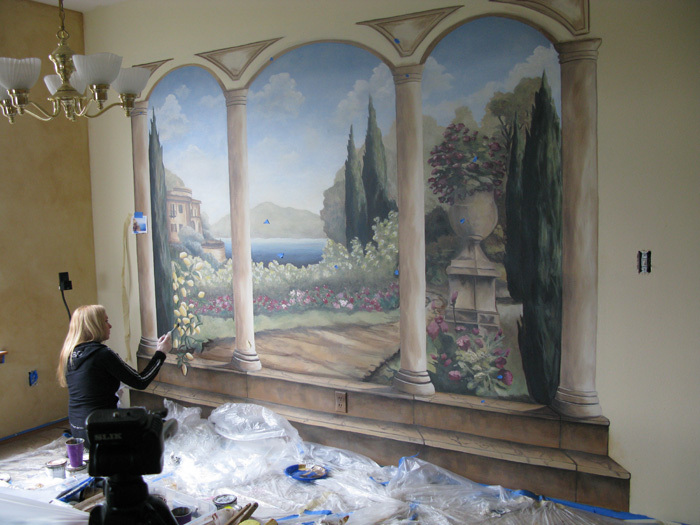 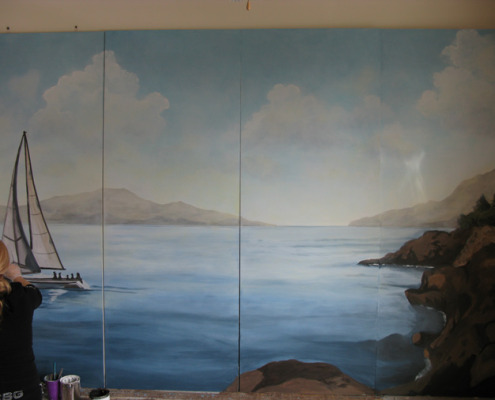 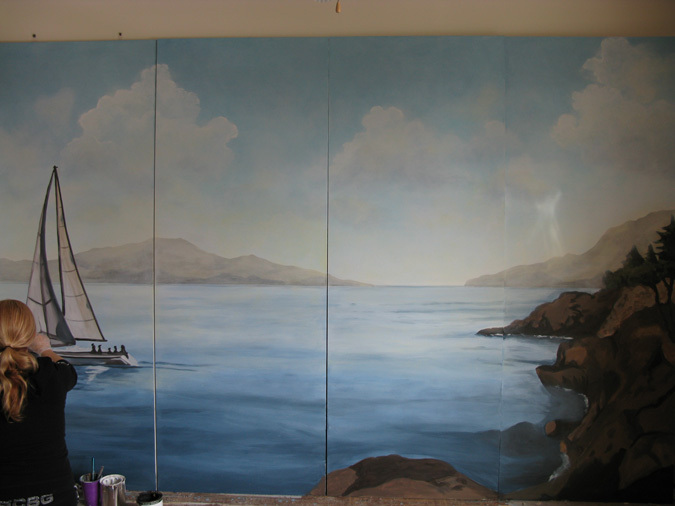 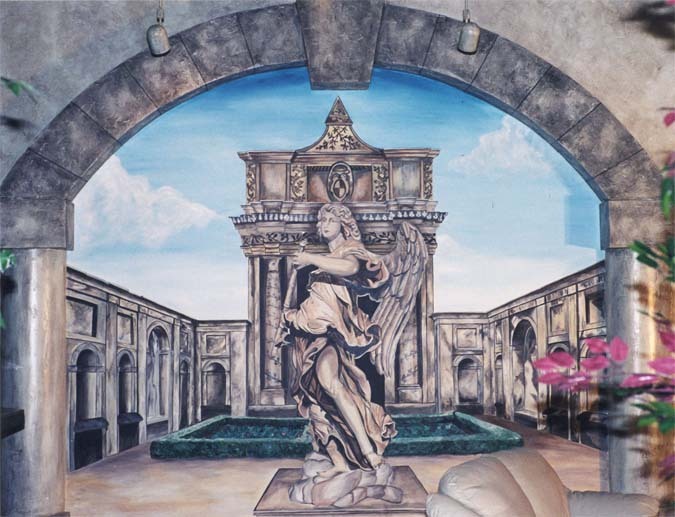 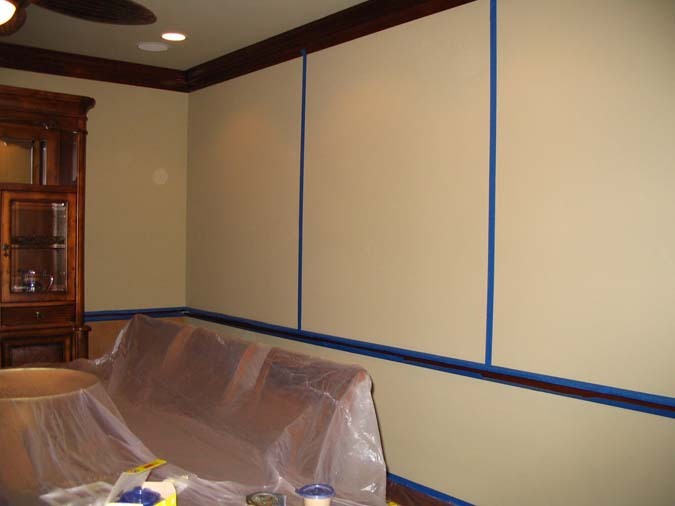 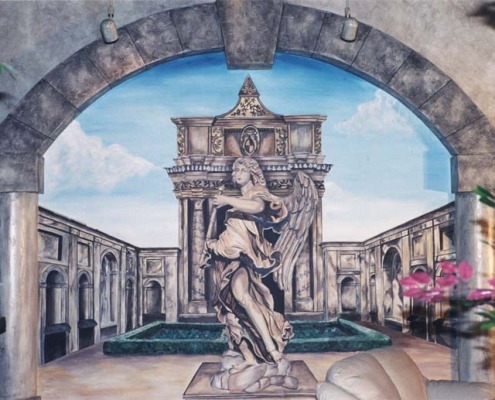 The skilled mural artists paint breath taking trompe l’oeil murals that will add to beauty and value to your home or business. 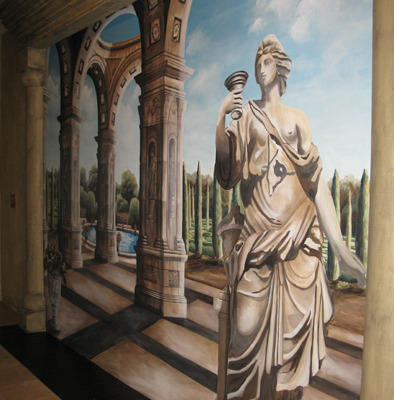 All of our murals are hand painted on your walls. 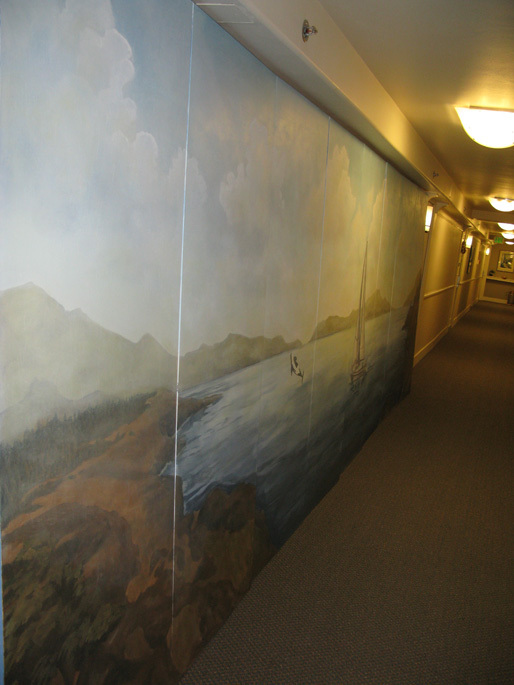 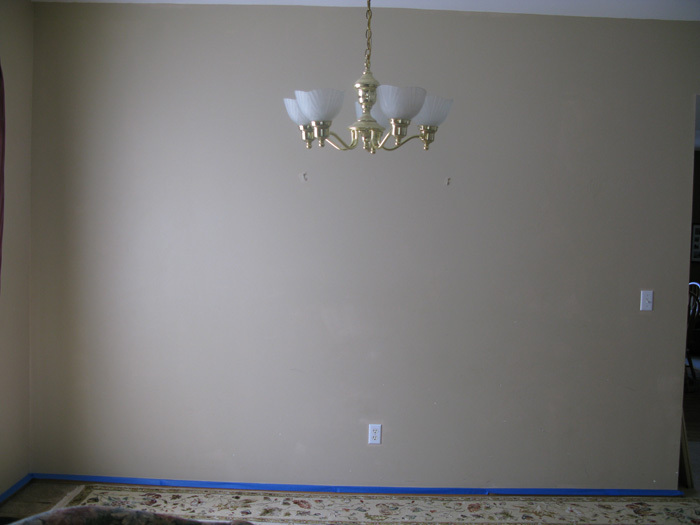 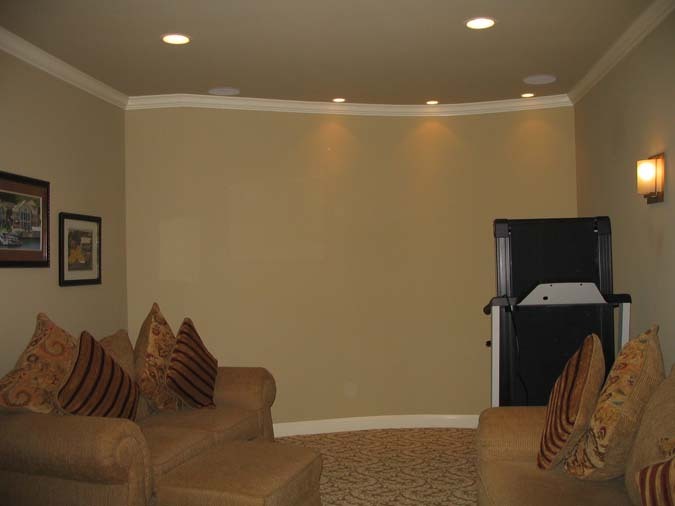 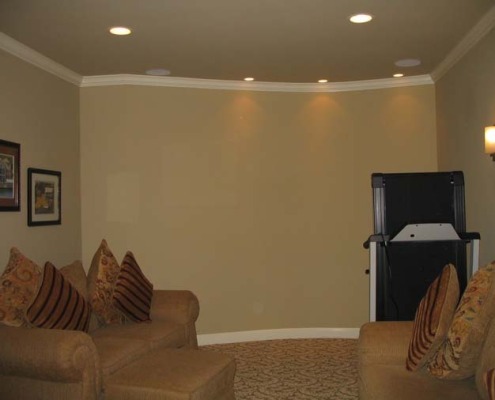 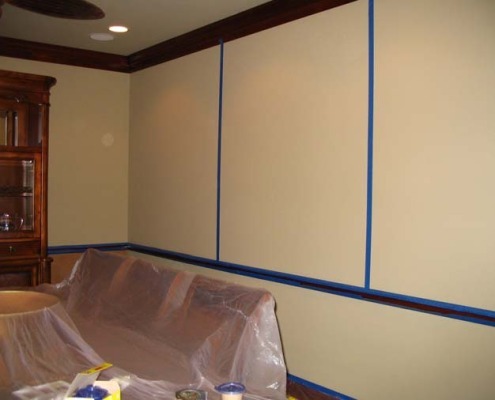 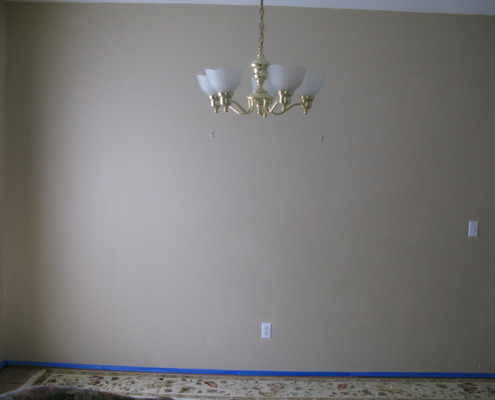 Our mural painters work in Seattle, Bellevue, Kirkland, Redmond, Woodinville, Sammamish, Mercer Island, Medina, Tacoma and surrounding areas as for south as Olympia.